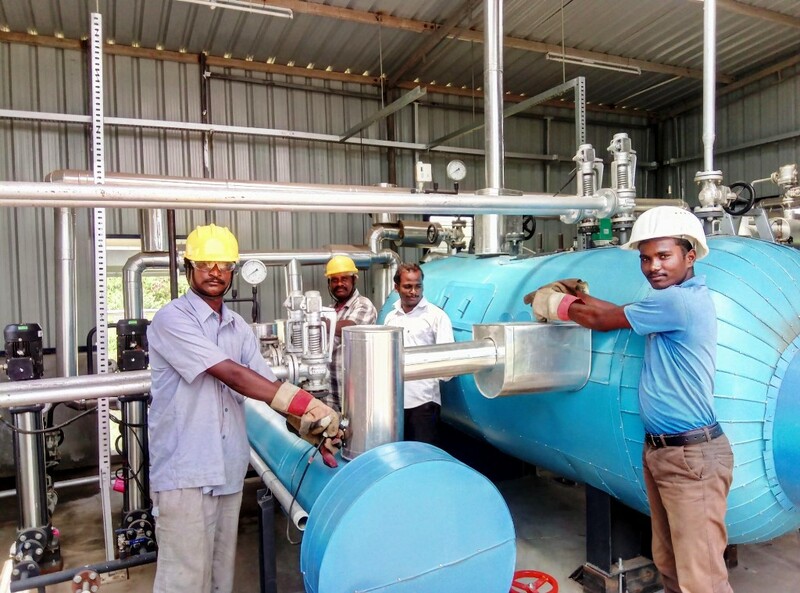 India’s first-ever commercial concentrating solar thermal plant, which consists of parabolic trough collectors made by German supplier Protarget, has been running successfully at a dairy owned by Hatsun Agro Products. As a result, Hatsun has inked a new agreement with the CST supplier to put up solar steam systems at other production sites in India. The initial plant was built by Protarget in partnership with Indian-based project developer Luit Renewable. The companies installed two 96-metre-long rows of parabolic trough collectors to provide Hatsun’s factory in Salem, in southern India, with 320 kW of thermal capacity. They commissioned the system in early 2018. The two rows of parabolic trough collectors in Salem replace coal boilers to generate steam which is directly injected into the factory’s pipelines at 220 °C and 20 bars. In the photo below, Hatsun staff is standing next to the pre-heater and the accumulator that are part of the installation. “This CST plant was designed, built and commissioned in fewer than nine months and has since been a reliable source of steam. The successful implementation of this project has convinced the customer to further invest in parabolic trough technology,” said Martin Scheuerer, Commercial Director at Protarget. Hatsun has benefitted from three funding mechanisms. The dairy received a 30 % investment subsidy from India’s Ministry of New and Renewable Energy, it makes use of accelerated depreciation, and it obtained a soft loan from the Indian Renewable Energy Development Agency (IREDA). Taking these incentives into account, the payback period of the system will be around four years. 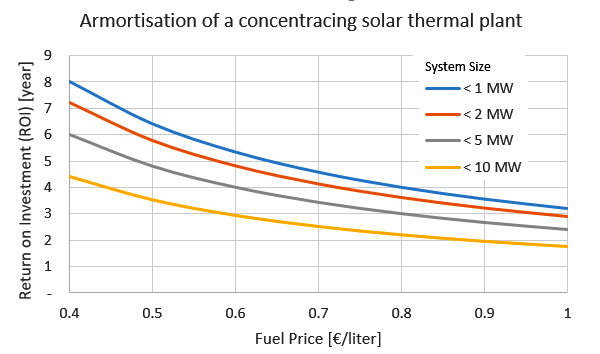 Static payback periods depending on system size and the cost of displaced fuel. The cost of finance and subsidies have not been considered in the calculations. The chart is based on a 20-year service life of the system. One distinctive feature of Protarget’s CST systems is their environmentally friendly heat transfer fluid (HTF). “Our thermal oil can be used at up to 425 °C, which results in output levels superior to those of systems using conventional thermal oils,” said Scheuerer. Hence, the HTF could lead to a reduction in field size and cost. Plus, the silicon-based thermal oil has more than one advantage (see the table below). For example, traditional HTFs made from mineral oil are toxic, while the silicon-based HTF is not. This is an essential requirement for industrial heat systems used in food processing. In 2011, Protarget began developing the HTF in partnership with German-based Wacker Chemie. One focus area was the low hydrogen formation of the new HTF. Hydrogen as the smallest element in nature tends to permeate the barrier surrounding it. During the duration of a concentrating heat system, some HTF hydrogen will dissipate through the absorber tube into the vacuum of the solar receiver and lower efficiency in the process. This effect is significantly reduced when using silicon-based HTFs.